Designed by Chester Lanzo and published in Dec 1940 Air Trails. Span - 56" - Area: 300 sq in and weighs approx 9 oz. 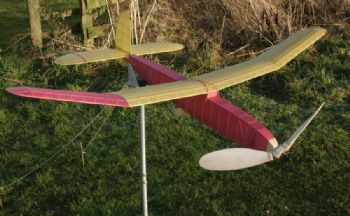 The Parts Sets includes laser cut parts, including wing ribs, stabiliser and fine ribs, fin/sub fin outlines, fuselage nose sheet, motor peg mount, nose block former, stab mount, plus wing mount parts. Just add sticks. No Plan included and the parts are designed for the Modle Builder Plan 1174-OT.